This book explores some of the major processes involved in the definition of school subject knowledge. Using historical ethnographic methods, the contributors to the collection highlight and examine some of the factors involved at national, institutional and classroom levels in the making of school subjects. The first section of the book outlines the theoretical and methodological basis for the study off school subjects, and the reasons for and the possibilities of such a study are considered. In the second section some histories of school curricula are presented from a variety of settings – colonial schools in Africa, working-class schools of the nineteenth century, nursery schools – and the conflicting forces of determination and change in school subjects are identified and examined. The third section focuses on the contemporary school situation and the papers isolate and investigate some of the interest groups and social processes which enter into or affect the realization of school knowledge in the classroom. 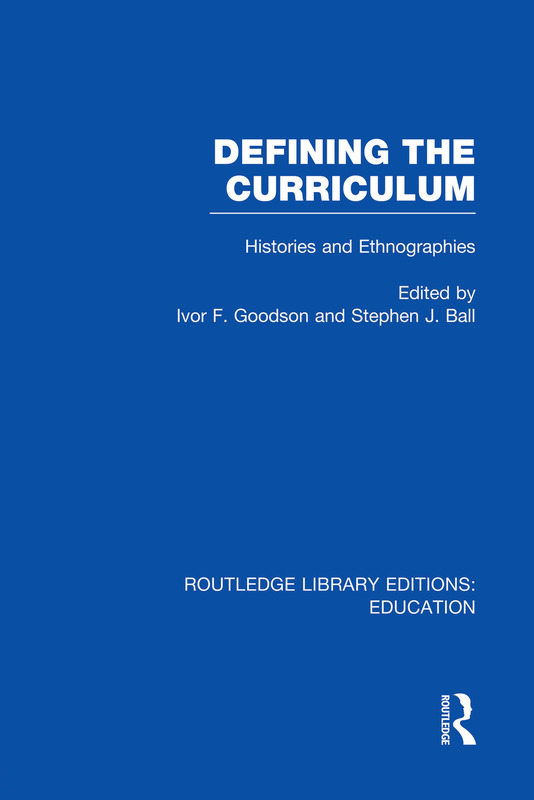 Introduction: Defining the Curriculum: Histories and Ethnographies Stephen Ball and Ivor Goodson. Part 1: Theory and Method. Making a Vice of Our Virtues: Some Notes on Theory in Ethnography and History Martyn Hammersley. Subjects for Study: Towards a Social History of Curriculum Ivor Goodson. On Explaining Change in School Subjects Barry Cooper. Part 2: Histories Curricular Topics as Institutional Categories: Implications for Theory and Research in the History & Sociology of School Subjects William A Reid. The Play House and the Sand Tray Clem Adelman. The Experience of Schooling for Working-Class Boys and Girls in Nineteenth Century England June Purvis. Imperialism, Social Control and the Colonial Curriculum in Africa Stephen J Ball. Ethnographic and Historical Method in the Study of Schooling Louis M Smith. Part 3: Ethnographies ‘It’s Not a Proper Subject: It’s Just Newsom’ Robert G Burgess. Pupil Perceptions of Subject Status Lynda Measor. The Amorphous School John Player. Teacher, Self and Curriculum Peter Woods. Seals of Approval: An Analysis of English Examinations Douglas Barnes and John Seed. Contributors. Index.